LEN - www.lankaenews.com | Much hyped ‘Raalasana’speech with much fanfare wasting colossal public funds is not official policy announcement ! Much hyped ‘Raalasana’speech with much fanfare wasting colossal public funds is not official policy announcement ! 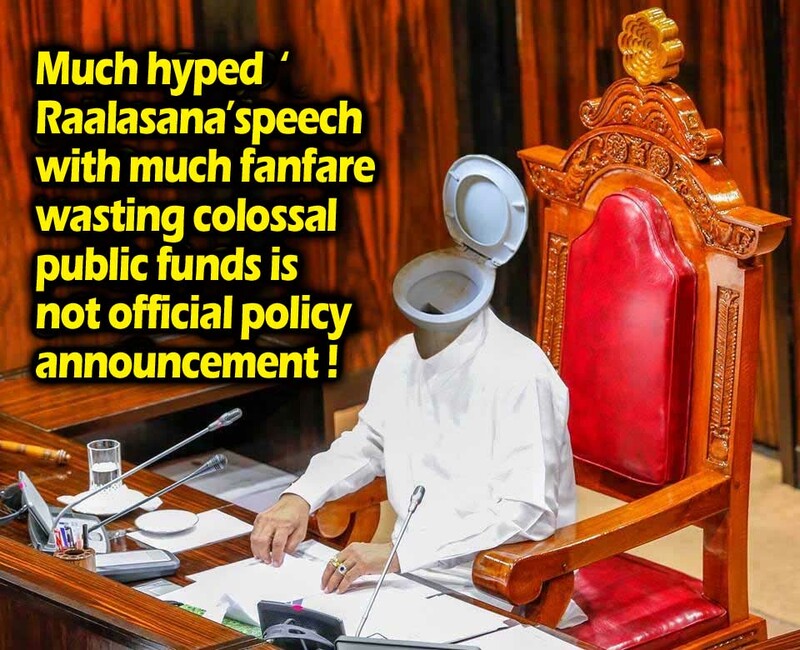 (Lanka-e-News- 13.May.2018, 11.30PM) The ‘Raalasana’ speech made by the president with huge fanfare , pomp and fuss on 8 th wasting colossal public funds when the parliament was re convened after the prorogation finally was not a policy announcement of the government and just turned out to be another of Pallewatte Gamarala’s usual blabbering, based on reports reaching Lanka e news. If his speech is to be a government’s policy announcement , that should be ratified by the cabinet. Strangely his speech was not even presented to the cabinet meaning that it was not government’s official policy announcement. According to unofficial reports, President’s speech ought to have been written by his two bosom hollow shallow pals , Malith Jayatileke and Shiral Lakthileke .As far as Lanka e news is concerned, if Shiral the notorious NGO crook had written, it is decipherable to no one. Even the devil will not understand it. Hence it is not possible to believe the story that Shiral the duffer wrote it. No matter what, the president’s speech was most empty and hollow that it did not mention any future program of work.